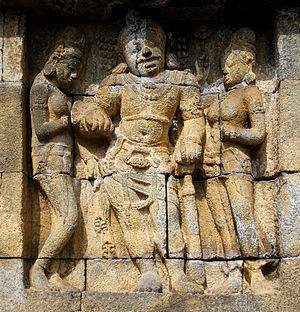 An asura (Sanskrit/Pali: असुर, असुरो) in Buddhism is a demigod or titanof the Kāmadhātu. The Buddhist asuras are broadly derived, in general character, from the wicked asuras of Hinduism, but have acquired some very distinctive myths which are only found in Buddhist texts. In its Buddhist context, the word is sometimes translated "Titan" (suggesting the wars of the Greek gods and Titans), "demigod", or "antigod". While all the gods of the Kāmadhātu are subject to the passions to some degree, the Asuras above all of them have become addicted to them, especially wrath, pride, envy, insincerity, falseness, boasting, and bellicosity. Beings may go to the Asura realm because in human form they had good intentions, but committed bad actions such as harming others. This article includes content from Asura (Buddhism) on Wikipedia (view authors). License under CC BY-SA 3.0. This page was last edited on 3 October 2018, at 07:26.